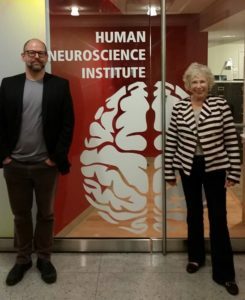 Adam Anderson, in Human Development's Human Neuroscience Institute, has received a grant from the Irlen Syndrome Foundation for an fMRI project being conducted at the Cornell MRI Facility on the relationship between color processing and other cognitive processes in the brain. Helen Irlen, founder of the Irlen Institute, identified a perceptual processing impairment, now referred to as Irlen Syndrome, which affects the brain's ability to process specific wavelengths of light. Below is a reprint of Dr. Anderson's blog entry on the Irlen Syndrome Foundation website. We have just finished our first study on color and brain activity. In our efforts to understand the role of color on brain function, we examined how different colors influence brain activity patterns. Well beyond color perception, we found colors have distinct roles not only in altering visual system activity, including the primary visual cortex and the thalamus, but also higher level regions including the parahippocampal gyrus (involved in representing the environment) and the middle temporal gyrus (involved in language processing and motion perception). We also found colors influence limbic regions involved in emotions and feelings, including the anterior insula (emotional body states) and the ventral tegmental area (VTA, a region that produces Dopamine, a neurochemical that influences reward processing and cognition throughout the cortex). In sum, color alters brain activity in ways that extend well beyond color perception to influence brain regions supporting perception, thought, language and emotion. Although preliminary, such results provide foundational support for color filters as means to alter brain activity patterns in focal brain regions, and the functions these regions support. These results lay the foundational neuroscience groundwork for future studies looking specifically at Irlen Spectral Filters. In our current study, we are building upon our earlier findings and undertaking more focused examinations of the influence of color on how information from the eye is represented in the brain, and the transmission of that information to the higher order portions of the brain that support perception, cognition (e.g., language and thought), and emotion. This study also assesses how colors influence brain activity to alter performance on tasks, including perceptual, cognitive and affective judgments. Results from this research will shed light on the neural mechanisms by which color can modulate brain activity and alter brain function. This study also examines the presence of Irlen Syndrome symptoms in the population at large, their neural bases, and whether these patterns of neural dysregulation are altered by color. 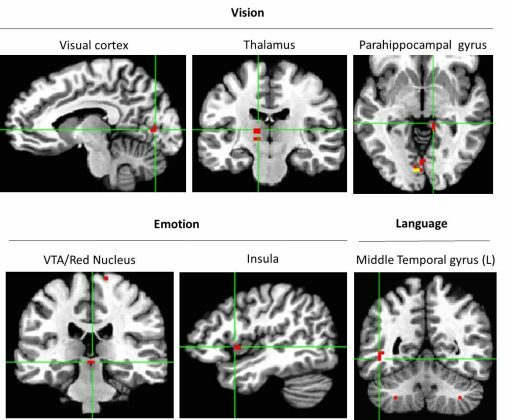 These findings should help establish how, rather than a retinal visual disorder, Irlen Syndrome arises from dysregulated brain networks, with different brain regions supporting specific symptoms. Posted in Features and tagged Adam Anderson, brain function, cognition, color processing, Cornell MRI Facility, cornell university college of human ecology, emotion, human development, Human Neuroscience Institute, Irlen syndrome, limbic, neuroscience, perception, reward processing, visual system on June 9, 2017 by Allison M. Hermann, Ph.D..